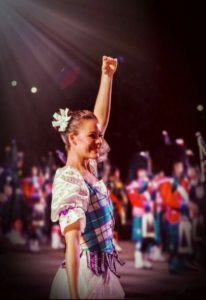 CCI member Kendra Brophy, daughter of Paul Brophy & Nancy Cunningham, is an accomplished Scottish dancer and is performing in this year’s Royal Edinburgh Tattoo in Scotland. A tattoo is typically defined as a military performance of music or display of armed forces in general. At one time there were many tattoos associated with the games in America but the cost of these events has now curtailed the number now associated with games. Canada’s Royal Nova Scotia International Tattoo is the largest annual indoor tattoo, each year featuring over 2000 performers from around the world.